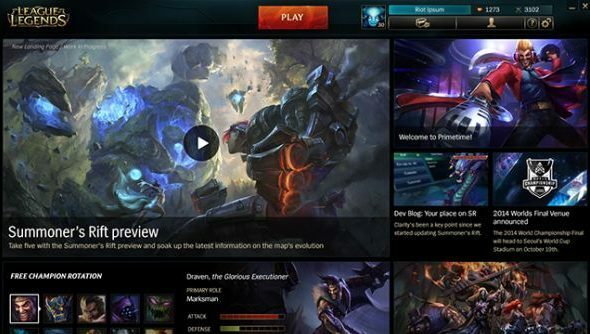 At any one time, nearly every part of League of Legends is being sized up for a revamp. Urgot is just the latest of many champions to get a new lick of paint, and the Summoner’s Rift is headed for the biggest update in its existence. But as everything changes around it, the game’s client has aged noticeably – creaking under the weight of every new character. No longer. Riot are busy laying the foundations for a new client, built on brand new tech. An update headed for the PBE represents the first phase of a long, thorough process of improving LoL’s pre-game experience. The new tech abandons the current LoL client’s Adobe Air platform in favour of Riot’s own code base and an HTML5 user interface. But it won’t all arrive at once. Updating the pre-match client is a particularly careful and laborious process, because ensuring the game remains stable “outweighs every other priority”. Riot will thus begin by testing LoL’s patcher and client landing page – though “a lot of the core tech” for the new client will be included in this first update. The patcher and client landing page will both be subject to some layout changes, to make LoL news and updates easier to parse at a glance. “These first iterations aren’t going to redefine your pre-game experience, but they represent work we’re confident we can safely build on as we test and expand on our new core tech,” finished Riot. Which aspects of LoL’s pre-match experience do you think are hurting one of the 100 best free PC games?